ZOYA announced a new promo code on their facebook page. 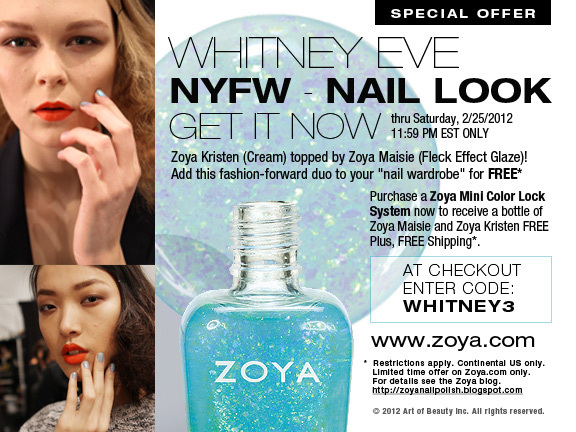 Here's the fine print from the Zoya Blog. Now through Saturday, February 25th 2012 11:59PM EST, ONLY. With the purchase of a Zoya Mini Color Lock System,you will receive a duo of Zoya Maisie, Zoya Kristen, Zoya Megan and/or Zoya Chloe FREE (the two you choose is up to you) PLUS... Free Shipping! Add the Zoya Mini Color Lock System (ZTHOL1101), at least two of the following Zoya Kristen, Zoya Megan, Zoya Chloe or Zoya Maisie to your shopping cart (along with any additional items you wish to purchase). Enter code: WHITNEY3 into the coupon/promo field in your cart and press "Apply Code". That's it for now Ladies. Till Later, God Bless.